Yesterday we ate at Wahoo’s in La Jolla (fast food Mexican place). They are famous for fish tacos, which I ordered. If you’ve never had a fish taco, you should. Especially in San Diego – there are some good ones in this town. The best I’ve had so far is an appetizer at “George’s” in La Jolla. A bit pricier, but sooooooooooo good. Cate was really feeling the music this week while we cooked dinner – it was like Dance Party USA around here. The Song of the Week is one that Cate danced like crazy to…King Without A Crown by Matisyahu . I know this is his song that everyone knows and I should pick something more unknown, but it’s just so good and Cate loved it. If you haven’t heard of Matisyahu, he is an orthodox jewish rapper/reggae dude. He’s great! I’m planning a few “special edition” posts… one on Snacks (inspired by Isa!) and one on Lunch ideas. If you have any ideas you’d like to share, please email me at weeklydinners@gmail.com – no deadline yet. I’ll post a reminder when I get closer to publishing. Have a great week and happy planning! – French Bread… or should that be Italian? I conducted a Brownie experiment this week. I cooked them in muffin tins (filled the cups about 1/3 full with batter and cooked for a shorter time at a little lower temp). If you like edges, you’ll love ’em this way. They stayed moist and I thought they were good. Not worse, not better than a normal brownie… but it’s a fun shape that would be cute if you were displaying them on a plate. Unfortunately I didn’t take a cute picture of the cute brownies… but here’s the batter, which is the best part anyway. Lastly, thanks to everyone who is coming to the blog! I’ve received lots of positive feedback and I’m happy everyone is enjoying and using the blog! And thank you to everyone who has shared their menus (Athena – you were the first menu from someone I don’t know – so fun!). 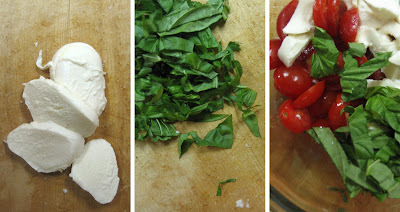 Last week’s caprese salad was delicious. My friend Adrianne was saying that she and her mom add pasta to make it a pasta caprese salad (serve cold or warm – she said cold is better). That sounds awesome… something to try one day for sure! Song of the Week: Let Go by Frou Frou. I’m sure other songs from the Garden State soundtrack will pop up… I just don’t get sick of that CD. I really enjoyed this song this week… and it always reminds me of the last scene of that movie – the song was perfect. Thanks to Emily and Margo for posting their menus last week!! You’ll see I did some stealing, and will continue to do so! Everyone else – please post your menus! You don’t need to worry about recipes if you don’t have time… just put up a quick post with your meals for each night. If you don’t start sharing menus, I’ll be forced to post fake menus associated with your names… for instance, I hear Adrianne is doing corn dogs every night this week… and we all thought she was such a good cook. Quick Note: I’ve split up the recipes into 3 categories. Also, if I’ve posted a recipe for an item on the Repertoire, it will link to the Recipes page. Hopefully this is all helpful! What are you eating out there?! This is a call for your weekly menus! Share your ideas… and don’t worry if it isn’t fancy. It’s all about getting different ideas – easy, classic, gourmet, anything! 🙂 And please pass the blog on to others so we can get their ideas too! to your menus and recipes! Happy Week 3! Don’t forget to check the “Recipes” page for new additions! Song of the Week: “Picture Of Jesus” by Ben Harper. I love Ben, it’s no secret. And this song is so beautiful. Features Ladysmith Black Mambazo, and who doesn’t love a little Ladysmith thrown into a song? The other day I was playing a song with LBM & Sarah McLachlan for Nate, who replied, “You know, if you like this song, you may want to check out an album called Graceland. Don’t know if you’ve heard of it.” Ha ha, real funny. Okay, confession time… I’m carrying over TWO meals from last week because I forgot we had date night on Saturday, and I was too lazy to cook on Friday. But I’ll add a bonus recipe this week to make up… The BEST Mini Molten Chocolate Cakes EVER… a great Valentine’s Day treat. They are not hard to make and definite restaurant quality. Enjoy and Happy V-Day!